In retrospect, 2012-13 St. Charles Seminary Appeal “was a great appeal,” said the seminary’s rector, Bishop Timothy C. Senior. Just how important is the annual appeal in a financial sense? Very important, Bishop Senior believes. There are three main sources of funding for the seminary, he notes. First, as is the normal case for a college, tuition paid by the students. Second, income from the Seminary endowment. Third, fundraising, most especially the annual appeal. 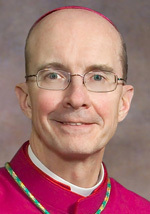 While at this time a majority of the seminarians at St. Charles are studying for other dioceses, each of which would have its own tuition policies, seminarians for Philadelphia in the College Division pay roughly one-third of the actual cost of their education; the balance comes from endowment income and the annual appeal. Students in the theology division do not pay tuition. That is totally absorbed by the seminary, but they still must pay for incidentals that can add up – for example health insurance, which is a must, plus any car payments and insurance, and other everyday incidental expenses that would not be part of room and board. “Most have to take student loans,” Bishop Senior said. In a perfect world, the endowment income would pick up the non-tuition costs. This isn’t happening at St. Charles, according to Bishop Senior, because there was a sizable shrinkage in assets during the recent recession, coupled with a steep decline in interest rates. “We have had to do some continuing restructuring; it’s all about being as efficient as we can be. We have to have a good formation program and not just wasting resources by taking care of buildings or subsidizing inefficiency,” said Bishop Timothy Senior. Total dependence on endowment income can have a disastrous effect, and one has to look no further than Philadelphia’s venerable Girard College, which has survived for almost two centuries entirely through endowment funds. But it is now at a point where it has had to suspend, at least temporarily, residential living. At St. Charles, where annual appeal funds would normally go into capital programs or plowed into the endowment, they are now being used to fund annual expenses. Raising money isn’t the entire answer. Efficient use of resources is just as important. Critical to all this is the ultimate consolidation of both the College Division and the Theology Division into that portion of the campus that now houses the Theology Division. In addition the seminary is reinstituting the Spirituality Year that had been dropped. Formerly housed off-campus in Northampton, Pa., it will now occupy a former on-campus convent renamed Neumann Hall, Bishop Senior said. At this point, there is not a specific plan on how the College Division property will be developed, and the archdiocese is working with the surrounding community for its input and concerns, according to Bishop Senior.